An 11-year-old boy was punched and sprayed with ‘silly string’ by a gang of teenagers – who were trying to steal an owl. The bird had been taken by the boy and his friend to be displayed at an event just off Morecambe Promenade last Saturday. But it is thought that they were turned away by organisers because the bird had not been vaccinated. The pair were walking along Euston Road between 3pm and 4pm when they were approached by the gang of around 10 teenagers outside Pound Fever. One of the gang said “Give me your owl,” and adopted a boxing pose. With an outstretched arm he then sprayed both boys with the silly string while shouting abuse. 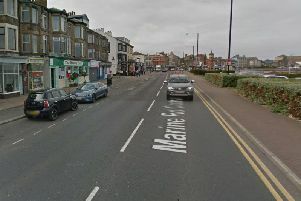 The shocked 11-year-old boy, who is from Morecambe, threw his drink at the teen before taking the owl from his friend. He was then twice punched to the side of the head as he and his friend fled in separate directions. The teenagers gave chase but both victims escaped, with the 11-year-old fleeing through the Arndale Centre while carrying the owl. PC Ben Hanley said: “This is a really odd incident. “The boy was not seriously hurt but he was punched twice and has been left with swollen cheekbones on either side of his face which could leave him with black eyes. He quite shaken up. Call Lancashire Police on 101 quoting crime reference BB1203964.